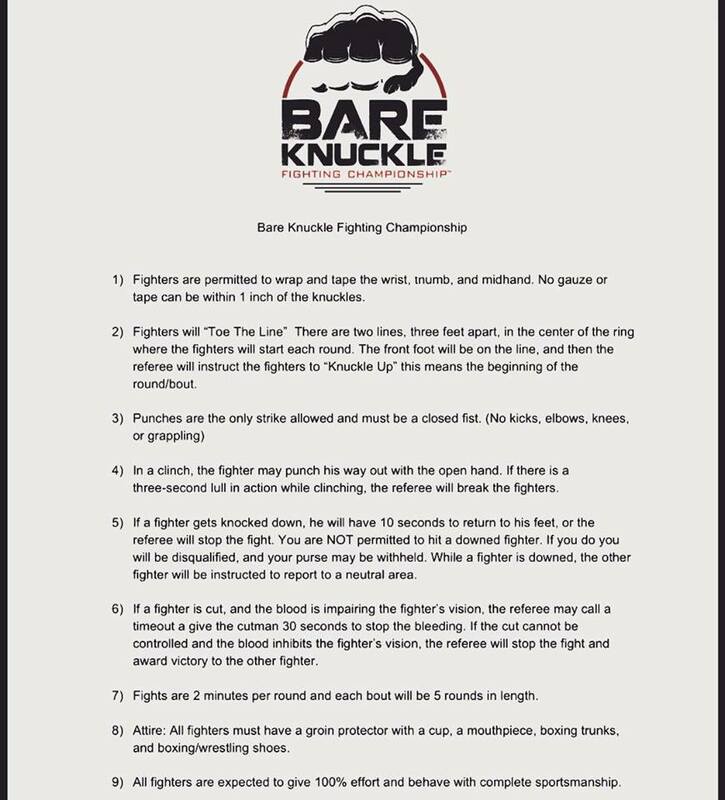 When you first hear the term “Bare Knuckle Boxing” you probably think about a scene from a movie where two hairy guys are standing in the center of a circle of people waiting to fight to the death. When the UFC first began people had similar misconceptions about the “brutal” sport that pit men against each other looking for blood. 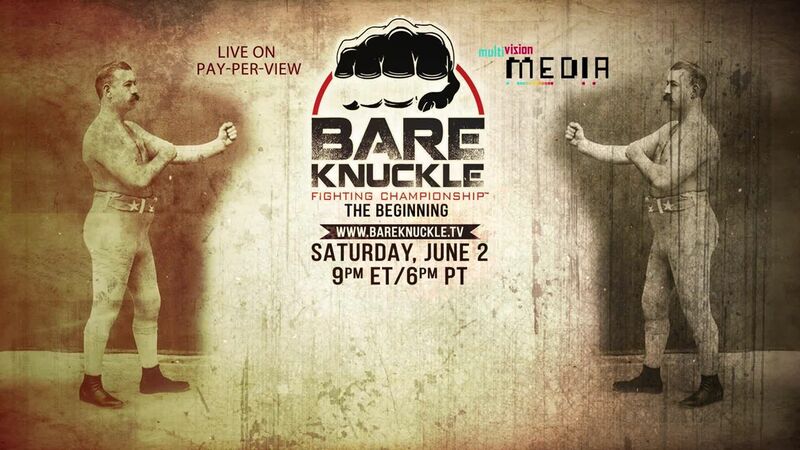 Bare Knuckle Boxing (BKB) is a relatively new form of combat sports that give die-hard fans of boxing and MMA another outlet to get their fighting fix. When I say “relatively new” I mean, the first Bare Knuckle Fighting Championship will hold the first “sanctioned” event in the United States in 129 years. 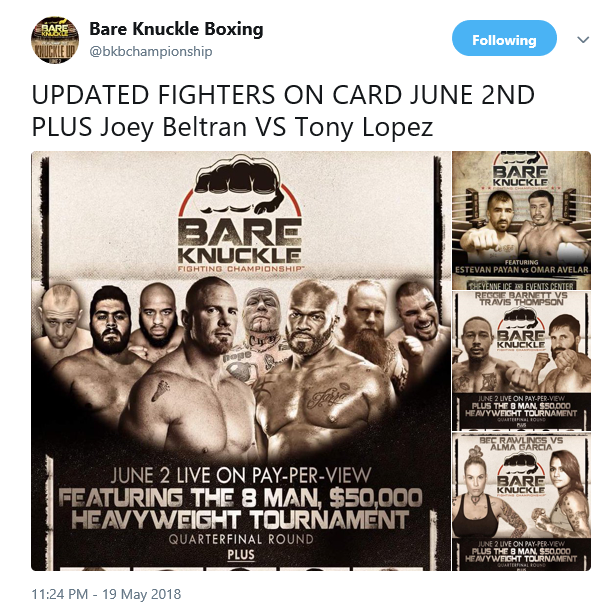 Not to be confused with the company “Bare Knuckle Boxing” which has been holding cards overseas for some time now, Bare Knuckle Fighting Championship is a United States based promotion run by David Feldman. Just as the name suggests, these men and women will be fighting without gloves to protect their hands and faces from damage, but it is a sport that will require skill and heart to succeed. Here are all the details you need to know about this Bare Knuckle Fighting Championship organization and the inaugural event. BKB will be holding their first legal, sanctioned, and regulated event Saturday, June 2nd. This event will be held in Cheyenne, Wyoming beginning at 9 pm ET. The event will be available for order on Pay-Per-View and can be stream below. The price for this event is $29.99. Get a $15 pay-per-view credit with code 9g78w1e. Some top names from the UFC and Bellator will be competing on this historic fight card. The fights will take place in a 22-foot diameter circle ring, with three ropes. In the center of the ring is an 8-foot circle where the fighters will begin the fight and start every additional round. The format is punching only strikes allowed, no knees, elbows, or kicks. They will be allowed to clinch and “Dirty Boxing” if you will is also allowed. Fighters will be able to throw punches in the open clinch or in a Muay Thai style clinch that includes grabbing the back of the neck. Fights will be 5 rounds lasting 2 minutes each, with the exception of the fight between Bobby Gunn and Marcelo Tavares, which will be 7 rounds. This event will also include the semi-final round of the heavyweight tournament. 8 heavyweight fighters will fight and the winners will go on to the quarterfinal round in September and then the finals will be held in December. The winner of the heavyweight tournament will be crowned the champion and will receive $50,000. The event will be officiated by well known Boxing official Bill Clancy and MMA referee Dan Miragliotta. Commentators Sean Wheelock and Antonio Tarver will be calling the action.